Many individuals who have gone through the Australian university system or another approved higher education provider will have opted to pay for their education via the HECS-HELP system. This system allows for your higher education to be repaid after your income reaches a certain level. In August 2018, legislation was passed to reduce the threshold at which taxpayers are required to start paying back their higher education debt. In the 2018-19 financial year, individuals who earn greater than $51,957 are required to start paying back their debt. From 1 July 2019 (the 2019-20 financial year), individuals who earn greater than $45,881 will be required to start paying. 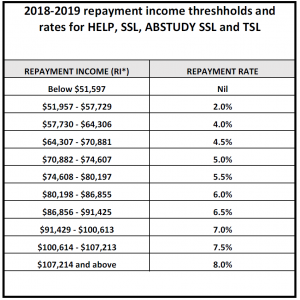 Below is a table of the repayment rates for the current year, 2018-19. The amount of debt to be repaid is determined by multiplying the applicable repayment rate by your income. In 2019-20 there will be a greater number of thresholds/repayment rates, increasing from 11 to 19. It is also important to note that the maximum repayment rate has increased from 8% to 10% for the highest bracket of income earners. If you earn more than these thresholds it is important that you inform your employer(s) that you have a HECS-HELP debt so that the employer can withhold enough tax from your wage to cover this debt. Otherwise, you will likely receive a nasty surprise when you come to lodge your tax return at the end of the year, in the form of a tax liability.